The circle has a radial gradient brush composed of two colours - we'll animate both of these. 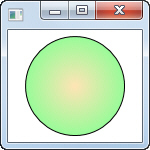 Start by creating a Triggers section for the ellipse in XAML. Within this create an event trigger, where the routed event is that of a mouse entering the ellipse (MouseEnter). Set this event trigger to begin a storyboard (you don't have to give it a name if you're not storing it in a separate resource). Now create your storyboard (setting it to repeat 3 times - 3x - and automatically reverse when finished). Animate each gradient stop, taking 1 second to change its colour.